When I’m traveling for my work I find running to be either one of my favorite parts of the trip or a chore to be slogged through. Typically this distinction is made based on where and when I’m able to sneak in a run. For example, my absolute favorite way to see a new city is an early morning run. The sidewalks and streets are relatively empty, and you’ve got no specific destination, so you really tend to get to see a part of that city very few people ever do. Yesterday my last meeting of the day was with a client who has also become a personal friend over the years, and when he realized that it was my last meeting he pulled out a couple of Nugget Nectars. How could I refuse? While we had a great meeting with discussion ranging from business to politics to bicycles (his stable is drool-worthy) this also meant that I didn’t get dinner until well after 8 and didn’t get checked in to the hotel until nearly 10. No time for a run there, so it was out of bed at 5:30 this morning so I can do a double (two runs in one day). Unfortunately, the hotel I was in wasn’t even on a road, per se, rather it was surrounded on all sides by parking lots, restaurants, and shopping malls. Off to the treadmill I went… Now don’t get me wrong – I think treadmills are valuable tools that serve a purpose. They’re great for intervals when you don’t have convenient access to a track. Ditto for hills. They also come in handy when it’s freezing rain or dangerously hot outside. An easy 6 miles when it’s 50 degrees out? Not so much. But there I was, sweaty and bored. Remember how I said it was amazing to run in a new city? This would be the opposite of that. 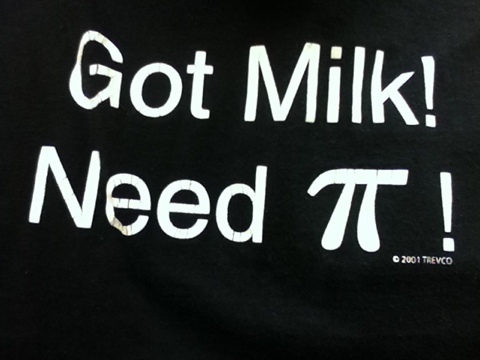 Before I forget, happy belated Pi Day!!! Any of you other diabetics out there: what does the change in season do to your insulin usage? When the weather turned cold I found I needed to increase my basal and reduce my I:C ratios, but it’s entirely possible that the season change coincided with the end of my honeymoon phase. To some extent it makes sense to me that insulin needs would increase as our metabolism slows for the winter, and Bill King (type 1 runner extraordinaire and Animas employee) told me at a race last year that he has some fairly significant seasonal shifts, but several other T1s I’ve asked don’t have the same issue. I’ll write more on this as the season progresses. A great weekend came to a close last night with dinner and drinks with friends. Several outstanding beers were enjoyed. When I’m having a few, especially if they’re higher in alcohol, I tend to test a lot. I really only mention this because I ran out the door this morning without breakfast (exceeding rare for me) meaning I didn’t test until I was at the office. And used my last strip. Crap. So not only did I have an unusual breakfast with more carbs than normal, but now I’m flying blind until I get home tonight. While I know everything will be fine, and I am erring on the side of being a little high, it’s not my preferred start to the week. To make matters worse, Mondays are my traditional rest day, so no running. I get grumpy when I don’t run. Also my shoelace just broke. Grrr. In other news, the Philadelphia Union start their season tonight. I’ve been watching a fair amount of EPL and some Bundesliga, but I just don’t have the same emotional investment as I do with the U. So tonight it’s off to the Iron Abbey where there should be a fair number of fans and the usual SoB’s. I’m not overly hopeful about the result, as historically East Coast teams tend to play poorly on the West Coast. Add to that the artificial turf surface, the diminutive field dimensions, and the always loud Timbers Army for a game I’ll be ecstatic to take a point from. Finally, I’d like to take just a moment to thank the folks who have taken the time to read this site and even comment. It’s truly gratifying to think someone might get some small measure of inspiration, knowledge, or even just entertainment from these pages. Thanks! There was a very nice comment left the other day by DiabeticallyYours in which she mentioned that she wishes she had my strength. I think she’s underestimating herself. I run to stay fit, because I’m results oriented and like the feedback, and most importantly because I enjoy it. The fact that it improves my diabetes control and reduces the chances of complications is, quite frankly, a bonus. Were diabetes control my primary concern I doubt I would run nearly as much as I do. The reality is that while regular exercise is a critical component of diabetes management, the workout regimen required to be a relatively fast marathon runner is, to put it mildly, overkill. Here is my challenge to anyone reading this blog, diabetic or not: do something active every day. Go for a walk. Ride a bike. Take a yoga class. Heck, play tag with your kids (or dog – now that’s a workout). The point is, every little bit counts, and the single best exercise you can do is the one you do consistently. Ran a pleasant 10 this morning. It was going to be 12, but around mile 9 my hip tightened up and I’m really trying to ease up the miles up slowly this season to stay healthy. I’m fine with cutting it a little short, and more importantly I finished with a blood sugar reading of 114. I’ll take it! In other news, Sheffield Wednesday have one two on the trot under their new manager and have a real shot at promotion this year, and the MLS season has started with some surprises. Most importantly my beloved Union start their season tomorrow night! One more thing: in my part of the world we set our clocks forward today. If you’re a diabetic, don’t forget to change the clock on your meter, pump (if you’re on one), and CGMS (again, if applicable). About a year ago I started feeling, well, bad. There really isn’t a better word to describe it, as I wasn’t sick, just bad. I was more fatigued than I had ever been, I was heroically thirsty (and peeing constantly), I was losing weight without trying, etc. Those of you who know anything about diabetes can see where this is going, and sure enough in May I was officially diagnosed as a Type 1 Diabetic. Formerly called “Juvenile Diabetes”, Type 1 is an autoimmune disorder in which your body attacks the beta cells of the pancreas causing them to cease the ability to produce insulin. Without insulin, the body cannot metabolize food into energy and you basically starve at a cellular level (yes, I know this is a gross generalization). That first month or two was a blur as I tried to adjust to my new normal; checking blood sugar 8-10 times a day, 4 injections of insulin, learning to count the carbs in everything I ate, and mentally coping with the reality that this was forever. There is no cure. Anyway, I was fortunate enough to have a great medical team, and one of the Diabetes Educators mentioned that Gary Scheiner (author of Think Like a Pancreas) was also a runner and that I should get in touch with him. Gary quickly responded to my email and pointed me in the direction of Insulindependence. Before I knew it, I had signed on to run the Philly Rock ‘n’ Roll Half Marathon with them. Type 1 Diabetes is relatively rare, accounting for less than 10% of diabetics. As such, I only knew one other person who had it, and really wasn’t prepared for the experience of spending time with other T1Ds. What I found was a group of friendly, compassionate people who were all going through what I was going through. I can’t begin to describe the simple pleasure of being out to dinner with a group of people and EVERYONE pulling out a meter to test before a meal. In short, I had stumbled upon a group dedicated improving the quality of life of anyone dealing with diabetes, young or old, Type 1 or 2, even “Type 3” (the loved ones of diabetics). And they’re succeeding. If you’re reading this you’re either my girlfriend, my mother, or possibly someone dealing with diabetes. Should you fall into that last group, you owe it to yourself to at least check out Insulindependence. Their mission is to revolutionize diabetes management through fitness oriented goals. There are other amazing groups that inspire us, like Team Type 1, but Insulindependence challenges us to be involved, to get out there and exercise whether it be Ironman, a marathon, or a walk around the block. They challenge us to take control of our health and to support each other. go to http://www.insulindependence.org for more information. A friend sent me an email with that subject heading. Do you suppose someone stole all his vowels? Maybe he has magically transformed into a teenage girl? So I changed my infusion set just before lunch, and I’m a bit concerned. (Note: an infusion set is the part of an insulin pump that actually attaches to you. It’s kind of like an IV) Normally after lunch I’d be in the 130-140 range. On a bad day I’ll be in the 160-170 range. I just check and… 208. Fail. Mind you, as a creature of habit I had exactly the same thing to eat I have every day, and I ran last night, so what worries me is that I could have a bad set. I’ll just have to keep checking to make sure it comes back down. Speaking of running: solid 8 miler last night. 65 degrees meant shorts and a short-sleeve shirt. Spring is coming! Afterward the girlfriend and I went out dinner and to have some Goose Island Matilda. Sooooo gooooooood. I know some of the beer geeks are upset that GI was purchased by AB/InBev recently, and I see their point, but until the quality of the product goes down it’ll be tough for me to stay away. Sometimes that’s all I ask for. Better. My run last night was better. Not great, but that’s okay. The first three miles were reasonably horrible, but then the legs started to open up around mile four and the final two were really quite pleasant. I actually considered going for eight, but I’m trying to be patient this year due to a history of niggling injuries. No dramatic increases in mileage and no running fast for another month. Boring, but hopefully effective leading into more specific training. On the blood sugar front, it’s been smooth sailing since the run last night. Very predictable and right in range. I don’t think it’s coincidence. So it’s been nearly two weeks since I started running in the Saucony Kinvara 2. I heart these shoes. Seriously. These are the first running shoes I have ever run in that feel like they just get out of the way and let me run my stride. Prior to these the most recent shoe de jour was the Saucony Ride 4, and while they weren’t bad, the significant heel to toe drop (12mm) made it feel like they were forcing a heel strike. They also felt a little disconnected from the ground, but I find that to be true of most running shoes. The new kicks, though – like an old British sports car: light, nimble, and with a great feel for the road. Also green. And underpowered (wait, that’s my fault). I think I’ve decided to run the ODDyssey Half Marathon on May 26th. Having missed out on the Broad Street Run lottery, I’m looking for something to give me a bit of a progress report, and I think that’ll fit the bill. It’s in late May, so it could be quite warm, but it’s also close, not too expensive, and perhaps most importantly sponsored by Sly Fox. It’s way too early to set a goal time, but I think I’ll be fit enough to PR even with the minimal speed work I will have put in by then. 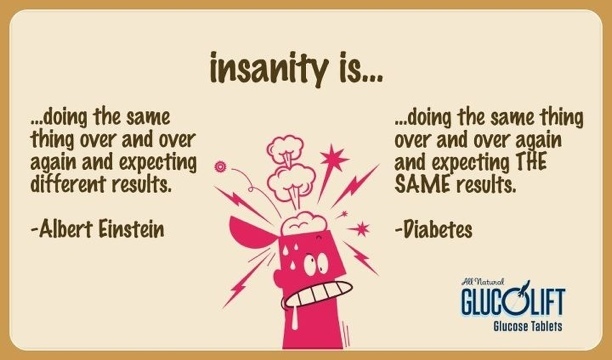 I’m coming to realize that in may ways, running and diabetes are the same. In my mind, A plus B should always equal C. Alas in diabetes and running, that is rarely the case. My diabetes is often even less predictable. So far today I’ve had exactly the same breakfast and lunch as yesterday, with exactly the same Insulin to Carb ratios, and I’m running about 20-30 points higher. Partly that could have something to do with the poor run last night, but mostly it’s just being insulin dependent.